It’s December! Again. I have dusted of some of the speckles of lint beginning to gather here. An unwanted break from the blog that extended into a bit of a Summer / Autumn interlude. And now here I am – it’s December and time for Christmas! Since July, which was the last time I posted, I have travelled – quite a bit. My travels took me to Budapest, Croatia, Florence to name just a few places I covered over the summer but I was also back in Dubai in October. 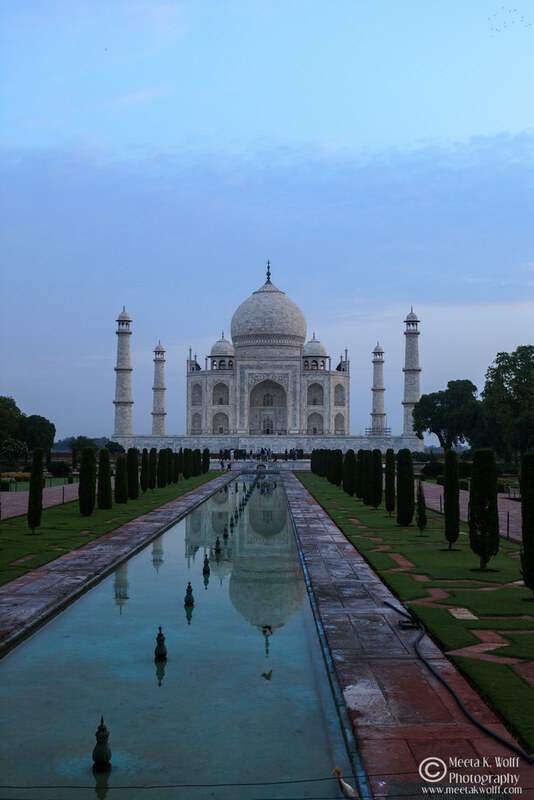 If you follow me on Instagram, I hope you have been enjoying the virtual trip. In the almost 12 years of blogging this is the longest break I took. It was good, as I focused on several things that I have been saying “I would love to …” for so long but always blamed it on time – or lack of it. I guess many of us find ourselves in that place. Sometimes it was a roller coaster ride of emotions, of a thousand questions, of even more thoughts and sleepless nights. 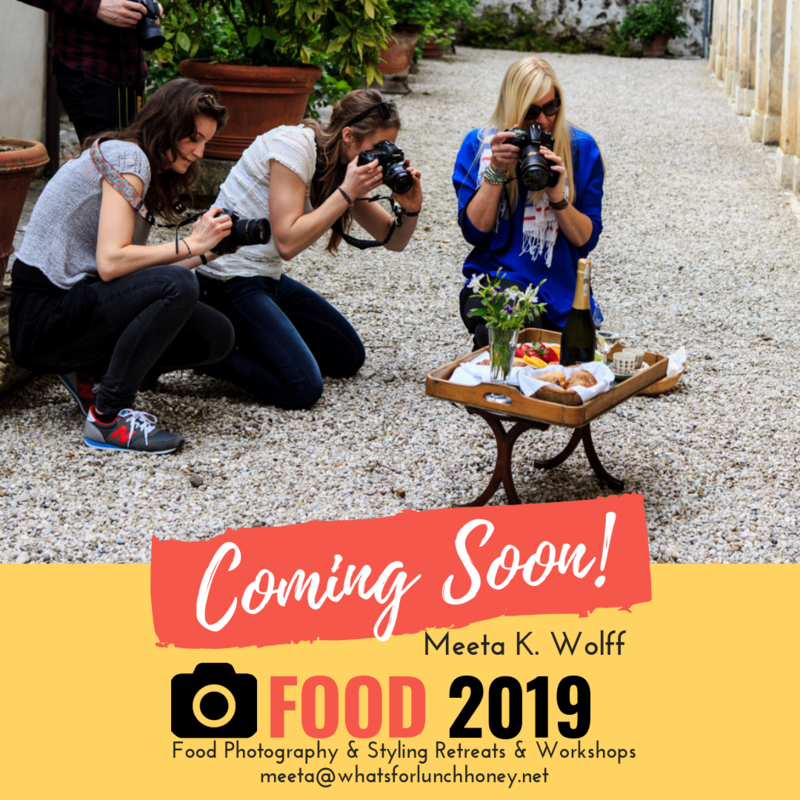 An opportunity came knocking on my door to open up a small bistro – long days of talks, of fidgeting with numbers back and forth, working on concepts and ideas – some days I was on a high other days I felt dragged down. 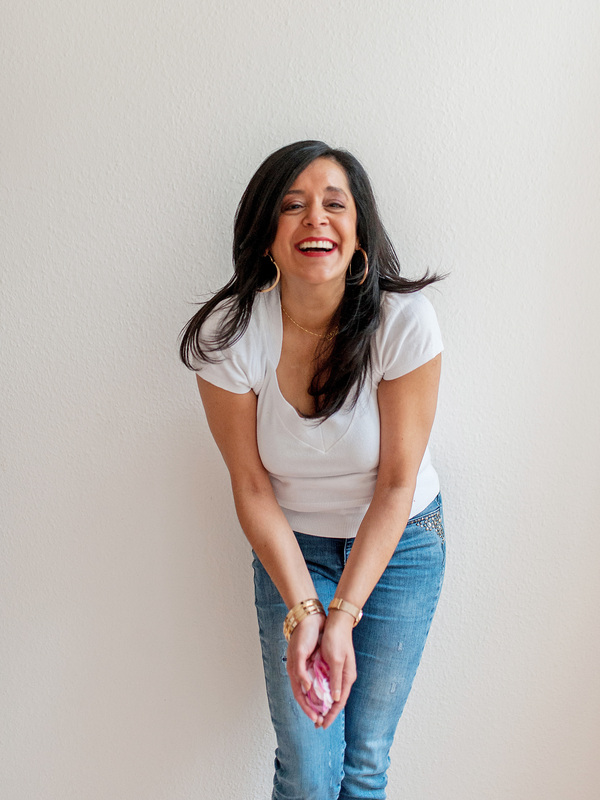 In the end I listened to my gut – always my sound beacon – and decided to let it go. I have not regretted it. Not long after, over lunch with a friend, we exchanged visions or those “one day I would love to …” ideas and realized we both had a similar idea. So without much fuss we jumped into it – outlined and put together the concept, planned and organized, did a lot of schlepping up and down many, many staircases and early November we were able to present our first Supperclub in Erfurt! It was a bespoke, convivial dinner where 18 lovely people took their place at our Kochen & Freunde table, guests who came from not only our region but also from around Germany to indulge in good mindful food, enjoy conversation and culture. We created an exciting multi-cultural menu - a fusion of ingredients and spices and we took our guests to the culinary high points of the Middle East, Persia, India and Asia! 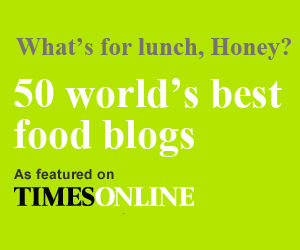 We cooked with turmeric, za'atar, sumac, cardamom, cumin, coriander, lemongrass and more. Market fresh pumpkins were turned into silky hummus, red beets into a divine moutabel, cauliflower was spiced with turmeric and sprinkled with barberries and pinenuts, flavorful Asian noodles highlighted with kaffir leaves and lemongrass and sweet and sticky medjool dates were mixed with almond butter and raw cocoa powder and dipped decadently into dark chocolate. It was good – actually looking back it was great – we took many notes and are ready for the next one, in planning for February. There was also Dubai, where I spent two lovely weeks with my parents and brother and had the rocking annual Dubai Food Photography & Styling Workshop. This time with a whole different set-up and a changed concept – inspirational, fun and so full of great participants. Look out for the entire review coming up – soon! Somewhere in between I managed to tour my region for a magazine I often work with and test, write and photograph some of the finest patisseries, bakeries and coffee shops for a big book coming out in March 2018. Soon I will be touring the region again – this time in search of the top Wine bars of my region. So although there has been a bit of inactivity on the blog, life and work has been filled with a lot of action. And here we are – it’s December again! The Autumn leaves, that once were alight with color have turned and withered, we’ve had our first snow, fairy lights are up on trees, candles flicker on the window sills and the Christmas markets are once again filling the air with roasted chestnuts and spiced wine. How can I miss out on my annual Christmas post? Once the emails and DMs began coming in, asking me when my Christmas post would be up I knew I had to get back into the jig of my blog. 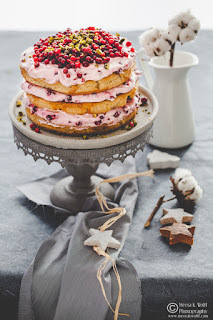 This year I turned towards the Nordic kitchen for a bit of Christmas inspiration. I love the concept of “Hygge”, the Danish word for cosiness, is about being snuggled indoors with candles, great comfort food, and lots of cakes and sweets. For me Hygge is what I need most when the temperatures drop! Similarly to Germany, Christmas season in the Nordic countries begins on the First Sunday of Advent, when the first candle in the advent candelabra is lit. 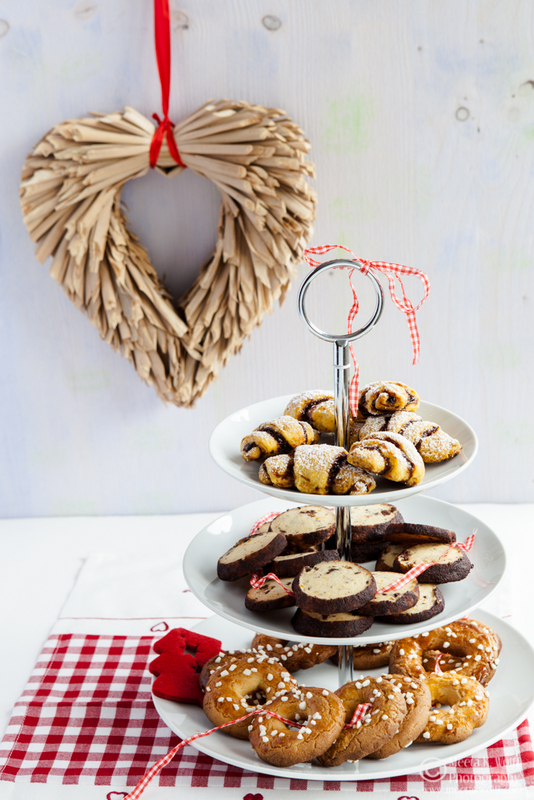 Families and friends come together and enjoy Christmas cookies, cakes and treats with coffee and tea. On each subsequent Advent Sunday, another candle is lit, so that on the fourth Advent Sunday, the last Sunday before Christmas, all four candles are burning. Lingonberries are packed with antioxidant power in the form of plant chemicals called polyphenols. Researchers have found that Lingonberries contain more polyphenol flavonoids than any other type of berry! 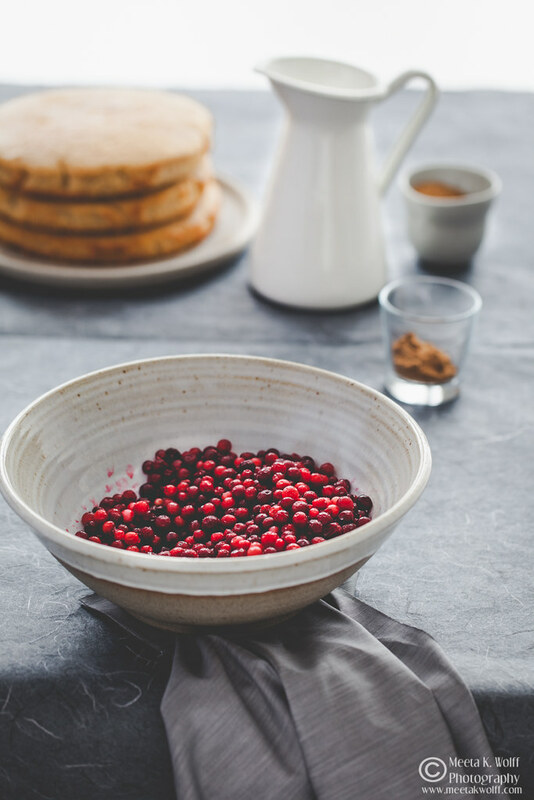 The benefits of lingonberries not only fortify your body with antioxidants, they also help your body replace depleted antioxidants such as glutathione. Glutathione is known as the “Master Antioxidant” because it fights off virtually every illness. Lingonberries (Vaccinium vitis-idaea) grow on low, evergreen shrubs throughout Scandinavia's forests, the tart red berries are much smaller and juicier than their distant cousin, the cranberry, and closer in makeup to the raspberry. Lingonberries are the last berries to ripen in autumn. After the blueberries and bilberries of July and August, lingonberries don't come in until September. Often they are frozen to be used over the winter months in a variety of ways. Bursting with natural preservatives and pectin, lingonberries were invaluable to earlier generations of Scandinavians, for they could be kept for months at room temperature simply by placing them in jars of water or by stirring the raw berries with a small amount of sugar to make lingonberry jam, where no cooking was required. 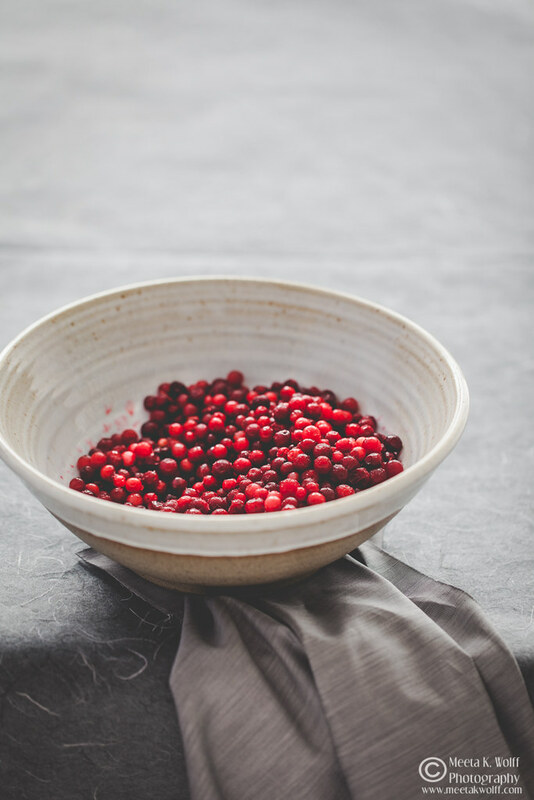 If looking for lingonberries or lingonberry jam in ethnic European food markets, you also may find them called red whortleberries, cowberries, foxberries, mountain cranberries, mountain bilberries, or partridgeberries. 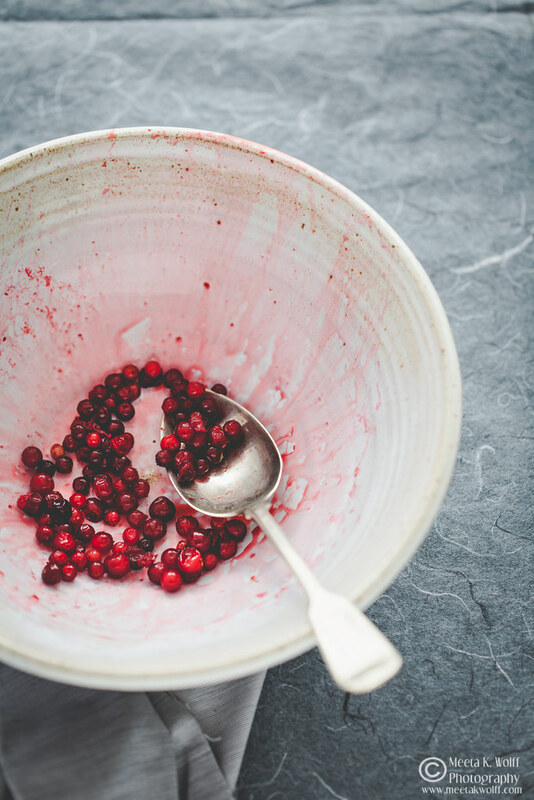 It's nearly impossible to find fresh lingonberries unless you can find an online purveyor, but frozen and canned lingonberries are widely available in the US and most European countries. Here in Germany they are called “Preiselbeeren” and can be found frozen or in jams in several supermarkets and the ubiquitous Swedish furniture store! This whole whole month is all about Hygge and enjoying food! 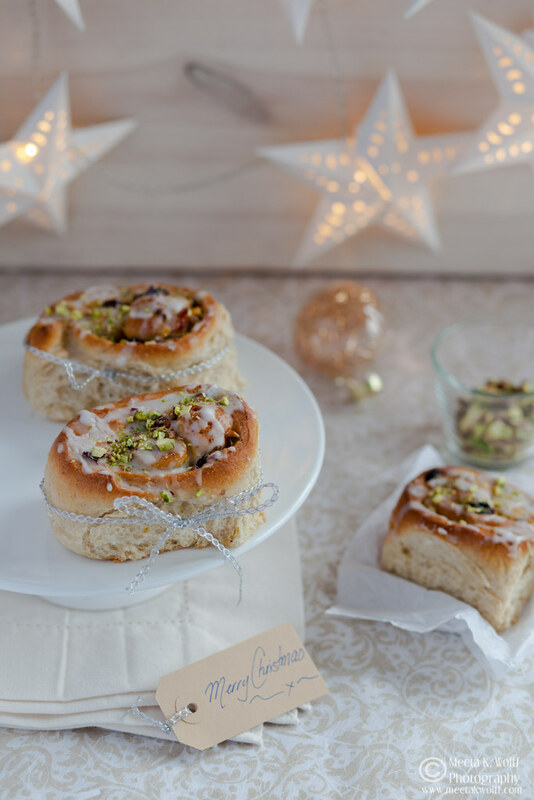 This year, besides a stollen I make each year, I went for something lavishly festive and bursting full of wonderful flavors. 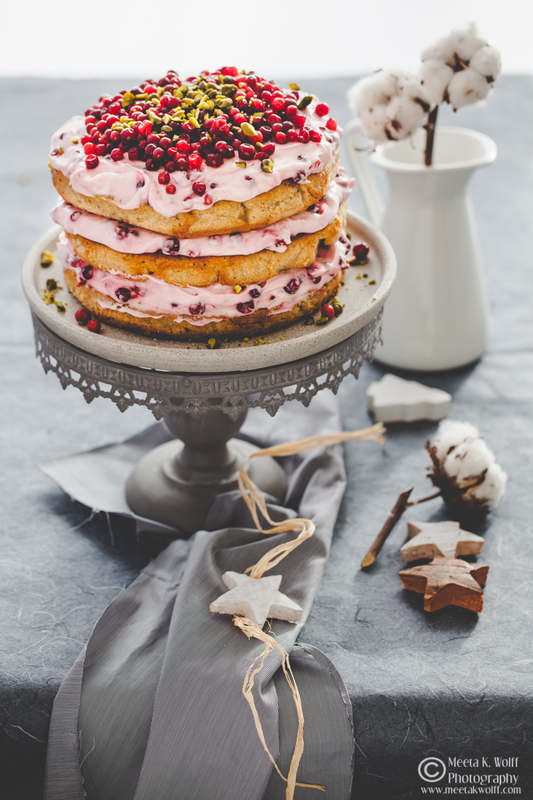 This year’s Christmas highlight is a cake that boasts of tart, fruity sweetness of the Lingonberries, while the bold spices of allspice, cinnamon, coriander, ginger cloves and anise seeds from the Lebkuchen paired with the cardamom brings warm comfort. Preheat the oven to 180 degrees C. Prepare 3 18-cm round cake pans by greasing them and lining them with baking paper. Beat the eggs with both sugars until the mixture is light, fluffly and almost doubled in volume. Use a stand mixer with a ballon whisk or alternatively a hand-held electric whisk. Sift together the dry ingredients in a separate bowl, then fold gently into the egg mixture. Pour the melted (cooled) butter and the whole milk and with the speed on low incoporate slowly. Divide the mixture between the three prepared pans and bake in the oven for approx. 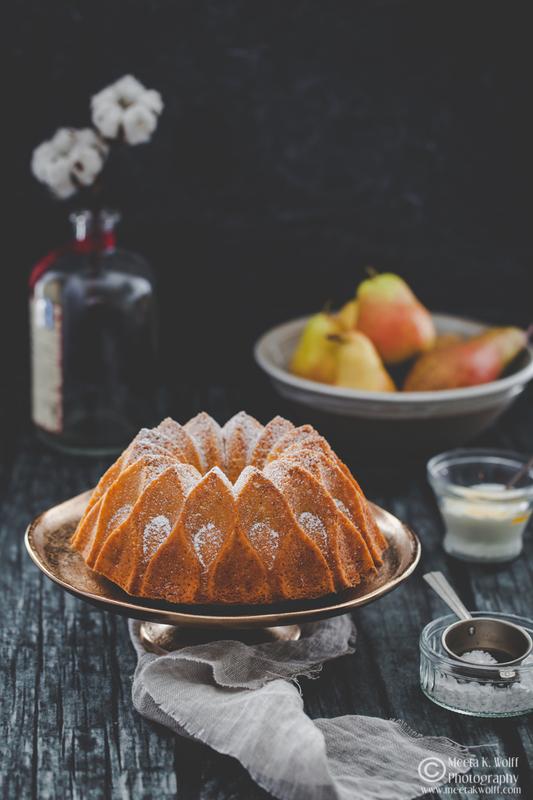 15 to 20 minutes or until the cake is beautifully golden, well-risen and springy to the touch. Test by inserting a skewer into the middle of the cake, if it comes out clean it's ready! Turn the cakes out on a wire rack and allow to cool completely. In the meantime make the icing by beating on high speed the butter, cream cheese and icing sugar using the paddle attachment on your stand mixer or the hand-held whisk. If there is a lot of liquid from the defrosted lingonberries, make sure you drain most of it, reserving a little bit for the icing. Add the lingonberries and gently fold into the icing, then add some of the reserved lingonberry juice to give the desired pink color to the icing. Assembling the cake from here is easy. Divide the icing into three parts. Place a sponge layer on your cakestand and spread over with a layer of icing. Repeat the process with the remaining layers. 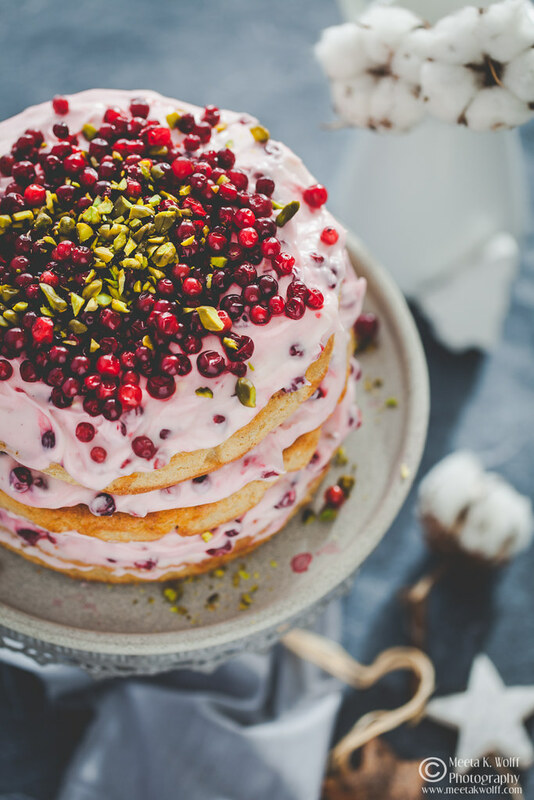 Spread a generous icing layer on your final cake layer, then scatter with the remaining lingonberries reserved for the decoration. Sprinkle with the chopped pistachios. I dived into something different this year - with this cake I seem to have hit all the right spots in the family. 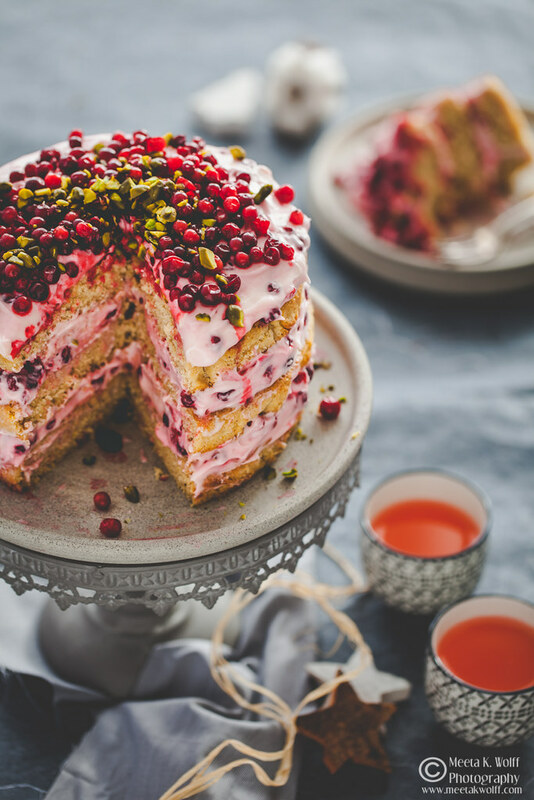 It is moist, aromatic and the zesty sweet tartness of the lingonberries add a fantastic accent to the entire cake. 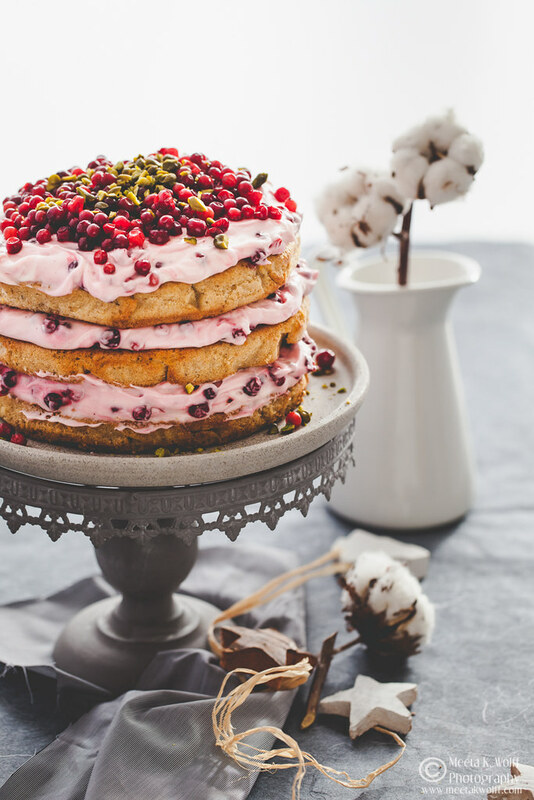 It will make a grand centerpeice at any table with the lingonberries throned like jewels on top of a cloud of creamy icing. A huge thank you to all and everyone who have been constantly writing and keeping in touch with me over the past few months via all the channels. It’s good to be missed and I look forward to getting back the blog mojo and catching up on all your blogs too. If you are looking for more Christmas baking ideas last year I started this awesome Christmas Cakes and Bakes Board and since then it has grown quite a bit. 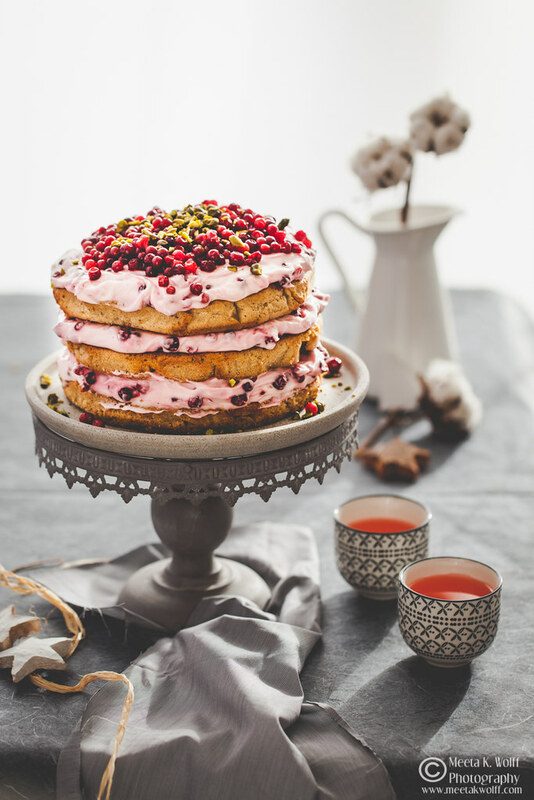 I love a stacked cake with lots of berries and the flavours in this one are just perfect. Spot on for Christmas and parties. Shared! I just checked out your Instagram. Such beautiful photos! It looks like you have had quite the year. This cake looks incredible. Love those layers with the lingonberries. Such a beautiful cake. I love the color of that frosting. And it's so perfect for the holidays. Sometimes it's really nice to take a break from blogging. Especially to experience new areas and immerse yourself in different cultures. I find it helps inspire me even more to come back at it with a clear head. :) You came back and created this absolutely stunning cake - so looks like it may have done the same for you too! This looks like such a delicious cake. It's really pretty as well. I'm glad you were able to travel so much! That cake looks good inside my tummy. Goodbye diet. Hello cake. This cake looks amazing. It sounds so delicious. Thanks for sharing. This is so colourful and a delight to just look at! I love that it includes some pistachios too! Oh my this cake looks amazing. It will be perfect for my Holiday party. I am sure it will be a big hit. Meeta! This looks absolutely divine. Bravo on the supperclub, it's something I sooo hope to brave it up and do something similar in portland when I visit next summer. You're really missed here in Dubai, it was indeed a fantastic workshop and can't wait to see you again next year. I just might really try making this cake or one of your stollens! The one you gifted us was soo darn good, I even photographed it! much much love. Wow this is a cute holiday presentation dessert. 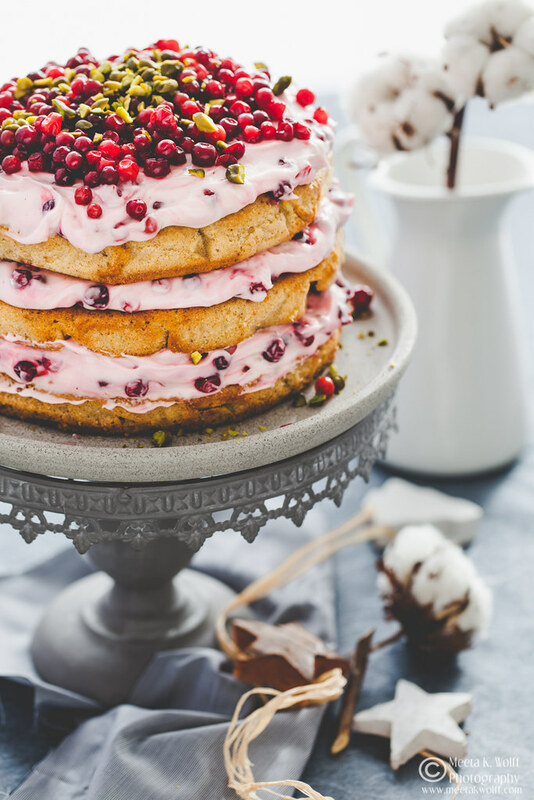 Creative way to use cranberries. This cake looks amazing! Welcome back from your break from the blog! 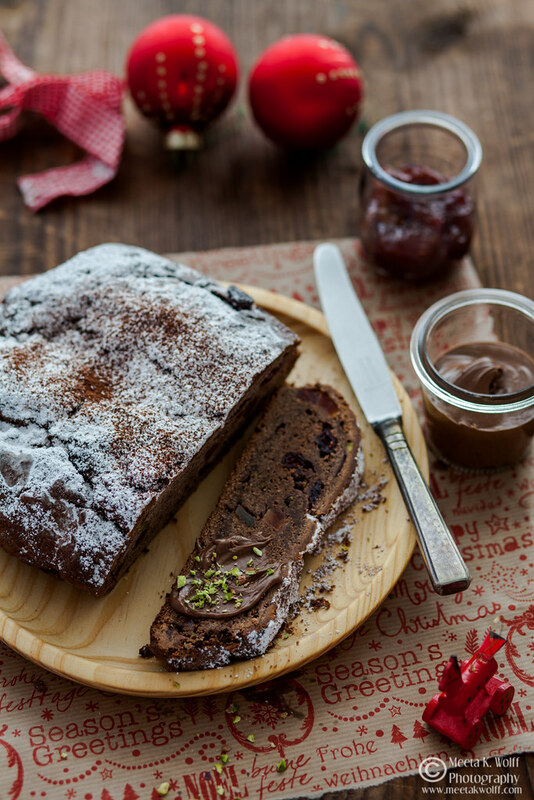 I love this lingon berry lebkuchen festive cake. It looks so delicious and tasty! I had never heard of a lingonberry cake. 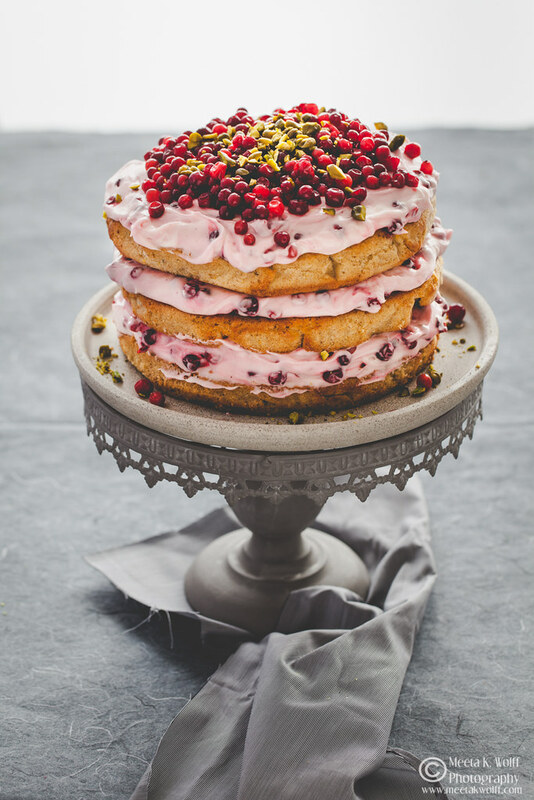 This looks delicious and I'm sure that the combination of the lingonberries and the pistachios is fantastic. That is one unique looking cake, bet it taste amazing too. And sounds like you had tons of fun during your travels. This cake is perfect for the holiday! Love the colors and the layering. This makes my mouth watery.Yum! I have had the lebkuchen in cookie form but this looks amazing. I need to make this for sure! This is one amazing looking cake. I am loving the presentation of it as well. That is a beautiful cake and it sounds like it must taste amazing! I love the dinner you described, too... I also have an appreciation for hygge. I have never seen a cake like this but it looks like something I wanna try. It looks delicious. That cake looks awesome! It actually looks like an artisan special cake. I can tell that ingredients are really fresh and its easy to make. I want to have a big old slice of this! It looks like it tastes amazing. I think it’s something ALL cake lovers should experience in person!